Today was just as hot as yesterday with a heat index of 95 degrees. The winds were from the south-west at 10-15 mph and the temperatures were in the mid 80’s. Up on the Avon beach bluefish, sea mullet, a few pompano and croaker were caught. Around the Buxton beaches sea mullet and bluefish were reported. Over on the Frisco beach sea mullet were caught. Down on the Hatteras beach sea mullet and croakers were reported. 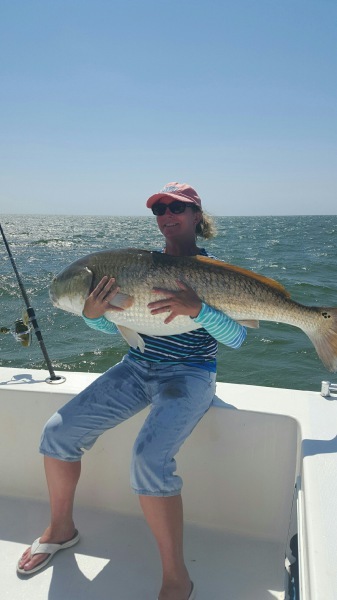 The inshore boats had some catches of Big red drum. Pictured below is Stephanie Tucker of Urbanna, VA with a huge 58 in citation red drum caught aboard “Tightline” charters out of Hatteras NC today. No boats fished offshore today due to the windy weather and rough seas. Slow sinking willow design, superior finish, stainless steel hook, screw, wire and split ring make this the best damn spoon on the flats. These spoons are made in the USA from the finest materials. Do not confuse these with cheap imported copies. 2016 Frisco Rod and Gun Tide Charts in. Swing by and pick one up! Another beautiful summer day here on the island. Today we had South winds 5-10 mph and temperatures in the high 80’s. The fishing was pretty good from the beach today. In Avon there was spot, croakers, blues, spanish mackerel, pompano, and sea mullet caught. In Buxton there was a few sea mullet, pompano and spanish caught. Here in Frisco there was some nice sea-mullet and a few pompano with some citation sized fish caught. In Hatteras there was sea mullet, croaker, bluefish and flounder biting. Inshore today the fishing slowed down some. the drum are still here and biting good. The spanish mackerel were biting today as well. Fishing was a little slower offshore today. The dolphin bite slowed was scattered. There was a few wahoo, amberjack, and blackfin tuna caught today also. The bill fish bite was good today with sailfish, blue marlin and white marlin all biting. 56th Annual Hatteras Marlin Club Blue Marlin Release Tournament continues today through the rest of the week. Here’s a link to their webpage http://hatterasmarlinclub.com/tournaments. Sperry sale shoes are now 50% off. We have new styles in for Spring too! New Guy Harvey, Hatley and Woolrich in for Spring. New t-shirt designs in also, kids and adults.